What does any one know on here about unnerrun heels? My Paint horse Illusion grows more toe than heel and has been off a bit on her right front ever since her first couple sessions with a trainer. My shoer swears she is fine and said her soles are thin and soft "squishy", partially due to the fact that we live in the soggy pacific NW. He put shoes and pads on her because he says she probably just has a bruised heel and the pads will help that heel. I tried to have the vet out but the lamness is very mild and hardly there so I had to cancel as the little turd wouldn't even bob her head for me when the vet was going to come, nor does she when the shoer comes. I hope my shoer is right and the trainer just didn't work her to hard. I never have hired a trainer before as I have been training my own horses since I was 11. but I was going through a series of shoulder surgerys and couldn't do it myself at the time. Isn't under-run heels when they are growing more heel? It just doesn't grow down like it should and goes forward? No, not really. Underrun heels are usually caused by farrier error IME. From farrier error, not trimming heels enough? Or maybe not trimming toes short enough for break-over? Well from what I looked up on the internet it's when the heel grows to forward and the toe is to long and the angles are not correct. I actually found the term underrun heels on the internet when I was looking up bruised heels. 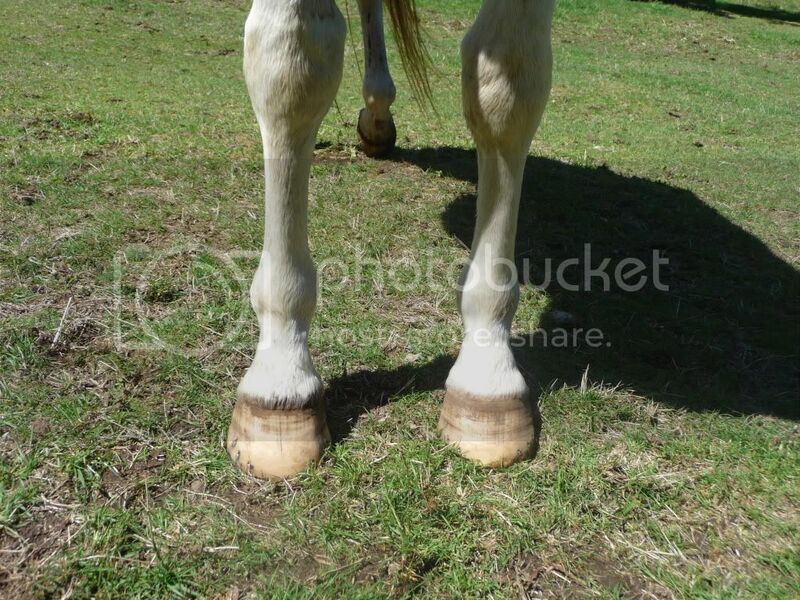 What ever the case my mare grows to much toe and it looks as if she has not enough heel but I'm thinking its because they are growing foward and under, and I'm wondering if that is contributing to her problem.We are working on that also. 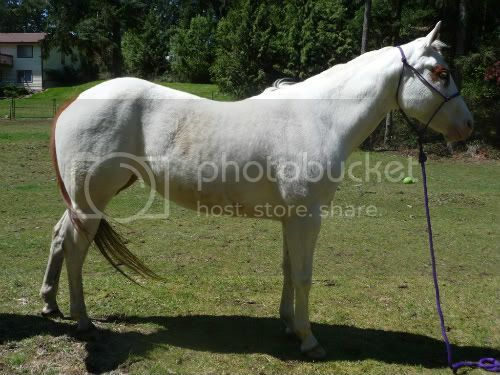 Her mom was kind of the same way but never had any lameness issues because of it. She grows too much toe because it's not being trimmed back enough. She has too much heel because it is not being trimmed enough. She appears to have no heel because it is all being crushed under her foot by her body trying to get it's correct pastern angle back. Get us a photo of her sole and I bet I can show you where her heels really are. :lol: This is a problem I see LOADS in racehorses. Ok but I have to wait until he does her feet again because she had pads on :roll: . I did hear that race horses have that problem and that sometimes trimmed that way on purpose, is that true? Do you think it may be contributing to her problem or even causing it? My farrier did show me that he soles a soft squishy, and not that way on my other horse, he thinks she is tender in both feet but I know she has heel pain in her right front because she will point it from time to time. I can get atleast get a pic of her feet and angles at this time, would that help? Personally I'd pull her shoes, but that's me. She needs a good trim that will get her back in balance and I bet you'd discover she's actually got nice feet under there after all. I'm not surprised by her having heel pain, but I'm not sure why her soles would be squishy... that's a new one on me. Thanks you guys, I actually went to farriers college in 1982 when I was 18 but ended up working another full time job so never kept up with it. That being said I still have some knowlege. 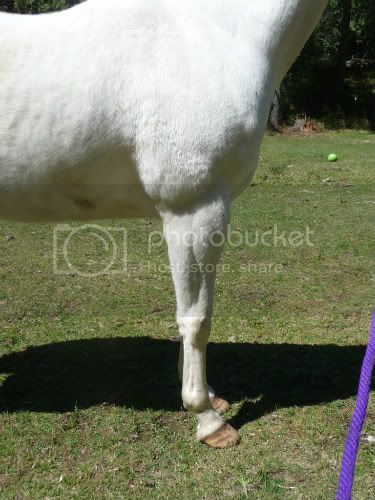 I dont think it's my farriers fault because he trims my other horses and their heels dont look like that. I think it is that way her foot grows. I will make the suggestion to him that maybe we pull her shoes and trim her more oftened, maybe every 3 weeks instead of 6. Her toe just looks way to long to me. I actually could probably get a new rasp and even work on it inbetween trims, that might be and idea. As far a her squishy soles, he showed me that when he pushes on her soles next to her frog it moves, its not hard he can push it down/in. We do have a very wet enviroment here is western WA, my other horses dont have the squishy sole problem like that but evey horse is different. The squishy sole is because it doesn't get enough stimulation to grow thick and healthy and doesn't have the support from a tight toe wall. Shoes only make this worse and pads will make them even softer (tons of moisture under there). Between that and the toe and heel it's meaning the wall is simply not being shortened enough at the trim or frequently enough. Some horses just need more frequent trimming than others. Most of the horses I care for (the ones with normal conformation at least) can easily go 6-8 weeks but one of my own will grow "swimming flippers" in that time and I trim him at 4 weeks and he has the best feet of all of them if you keep up on it. Just about all distortions of that sort are caused by excess length. 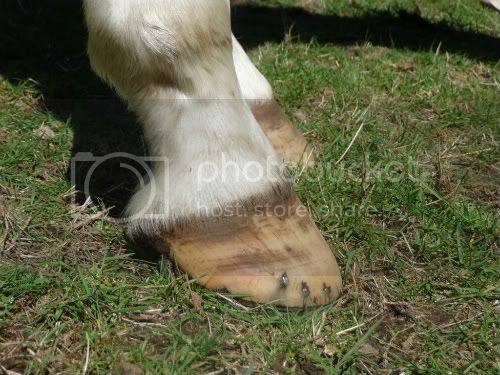 A shoe prevents wear and adds length and so is generally a bad idea on a hoof that is showing signs of being too long. Underrun heels are pretty much when the hoof is long and the horses weight is too much for it and the heels crush down. (happens easily on the hinds of some heavy stock horses) To correct it you just trim well and often. edit: highly recommend a pair of hoof boots for exercise if you remove the shoes. Like a pad and flexible shoe, only removable - and better. Brand wound depend on what you're doing and hoof shape. Light riding you could try the Cavallo Simple boots (I don't have experience with them but they seem decent for the price if you're not doing much to wear them out and if they fit well), at the higher end you have something like the Swiss Boot (completely modifiable to hoof shape and long lasting and minimal hardware to break, but you have to find a "fitter"). The easy care boots are popular and if you can get one that fits despite the long toe shape (which can take a few months to completely correct) they should be good. (Old Macs tend to be rather roundish though, probably wont fit). Thanks for all of your's help, that has given me alot to work with and confirmed some of my own thoughts. I was thinking of getting her the boots to wear also. I took alot of pics today and even with the pads on I think you can see what I'm talking about. I also took 2 videos one at a trot and she seems ok, but somtimes when she turns you can tell she is tender on the right front and I was able to get that on a video today. time is the key to my palomino, he needs I swear to be done every 2 weeks, no lie, if I dont then he falls apart quickly, needless to say i havent been doing him every 2 weeks, more like 4-5 weeks... but ive been workin the girls more and have been my focus lately, he is sorta on R& R .. i got to get back on his feet though there is some mounted shooting days coming up and he starts tripping alot when he is outta wack.. 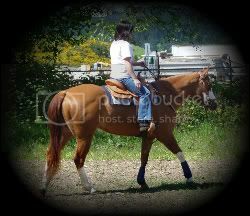 I went back and looked at horse.com and the Cavallo boots were the ones I was looking at, they are only 130.00. Does any one know, does it just go by whatever your horses shoe size thats what size they would wear in the boot? Oh yes, they're WAY too long. I can easily see how long and crushecd under her heels are in the side shot (and usually I prefer a solar shot for that). She's even bull nosed and flared. I hate to say it, but this really is just bad farrier work. I think this girl looks to have pretty good feet, they just need alot of help to get back to where they should be. Can you trim yourself? If not I'd be on the hunt for a new farrier/trimmer. Make it clear what you want before they even touch her. Also... keep in mind not to let them do it too fast. Some farriers get a bit reckless about getting the foot back to the visually right shape and can really sore a horse badly if they don't take their time. I'd love to see a solar shot but I'm betting there is LOTS of room to work with on this foot though. Yes you can easily see how all her weight is on her heels, what is a solar shot? I can still trim but my shoulders are shot so :( thats my problem, I might beable to rasp them a bit inbetween trims. Did you look at the videos? Unfortunately I'm not good at determining much from a video. FWIW that photo shows a fairly correctly trimmed hoof with the heels pretty close to the right place (they could come back a hair more). Ok thats what I was thinking you meant but wasn't sure. She has the pads and shoes on so not possible until I get those off. Oh... duh. :rofl I forgot about that. My Paso Fino mare has very flat feet caused by underun heels, the farriers here don't ever seem to sort it out, she is now un-shod and I ride her in Old MAcs just on the fronts but she never grows a lot of hoof which doesn't help matters at all !! !